Saturday 16th July saw the Torquay & District Soroptimist’s hold their annual Summer Fete at Rosegarth, Torquay. After this successful fund raising event members met with Councillor Derek Mills and his wife at the ‘Old Maid’s Perch’ Torquay. 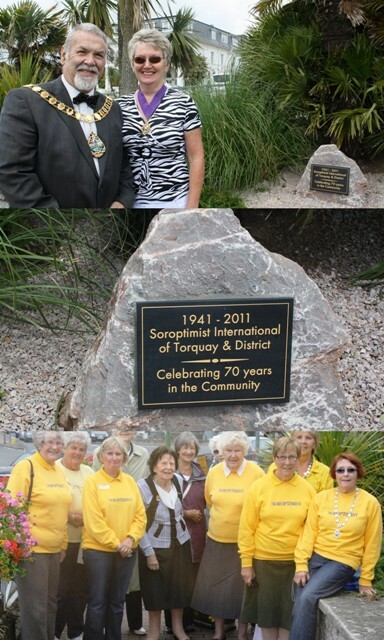 Councillor Mills unveiled a plaque as a permanent reminder to celebrate the 70th Anniversary of a Soroptimist Club in Torquay and District. During this time the club have given service to the community and worked hard to collect and then donate money to various charities both local and abroad. The club support the wider aims of Soroptimist International and their commitment to improve the lives of many, especially women and girls.